Our talented friends at the production company Dress Code have released their latest project. In celebration of Wayne White's current show I'M HAVING A DIALOGUE WITH THE UNIVERSE AND YOU'RE JUST SITTING THERE, the team strapped White to the back of a flatbed truck and drove around NYC, while the artist played the banjo. We can't thank Dress Code enough for their creativity and dedication to all their projects. 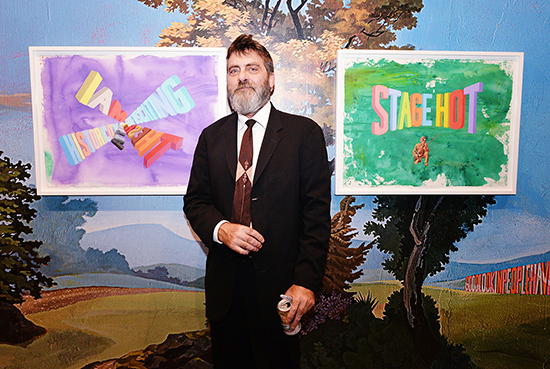 There's two more weeks left of Wayne White's show, which closes October 8. 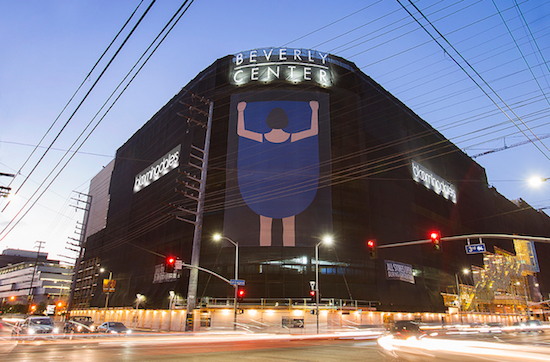 Geoff McFetridge's "Girl Lifting Skirt 2" is currently decorating The Beverly Center, which is undergoing a large scale renovation. Curated by Jenelle Porter in association with the Hammer Museum, the project also includes work from Catherine Opie, Dave Muller, Karen Kimmel, and Julian Hoeber. You can read more about the project on LAist. Thank you to everyone who joined us in celebrating Wayne White's second solo exhibition with the Gallery I'M HAVING A DIALOGUE WITH THE UNIVERSE AND YOU'RE JUST SITTING THERE. For the full selection of opening photos, please visit our Facebook page. The exhibition is currently on view through to October 8.